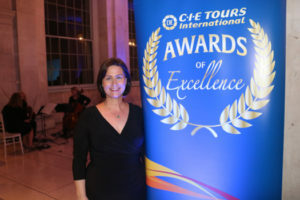 Leading tour operator CIE Tours International has announced the winners of its 29th Annual Awards of Excellence. The ceremony, held at City Hall in Dublin, named 77 hotels, tours and attractions in all. The shortlists were based on feedback from 32,000 inbound tourists. The bar was set high for competitors – each had to achieve at least a 92pc satisfaction rating in the survey. Thirteen overall winners were announced by CIE Tours International’s Chairman Vivienne Jupp and CEO Elizabeth Crabill. Merit awards were also presented to 64 hotels and attractions. Elizabeth Crabill told Travel Extra at the event: “2018 was a really strong year for CIE Tours but also for Irish tourism in general. We [CIE Tours] reached a record of €120m in revenue, which is a 13pc growth on the year before. That was really great for us but also for our partners who are here tonight getting their awards. While new routes have been added from Asia, the core business is still from across the Atlantic, with greater connectivity playing a huge role, she said. “We’re testing the Asia market, but it’s a test; we consider it to be in its infancy right now. Ms Crabill added that it’s looking to grow the Canadian market, and also increase staff numbers from the present three in that market segment. On the issues facing the industry, including the jump in hospitality VAT from 9pc to 13,5pc, she said: “I think the VAT is a challenge across the board for everyone in Ireland, so whether it’s for us, it’s the same for everyone.” She said “once that spike is absorbed, we’re going to have to move on, but it is unfortunate.” Potentially of more concern are geopolitical factors, including Brexit, she said. CIE Tours International itself is celebrating 87 years in business this year, and employs 140 between its offices in Dublin, London and New Jersey. Ulster visit merit: Slieve League Cliffs, Giant’s Causeway, The Causeway Coast Discovery Centre. Connacht visit merit: Dan O’Hara Homestead, Connemara Celtic Crystal, Kylemore Abbey, Westport House, Ballintubber Abbey, Dún Aonghasa. Munster visit merit: Cliffs of Moher, Marine Bar Waterford, Charles Fort, Blarney Castle, House of Waterford Crystal, Muckross House and Gardens, Tangney Tours Jaunting Car. Leinster visit merit: Cooks Academy, Kilkenny Castle, Greta Power, Bungalow B&B, Kilmainham Gaol, Glendalough Visitor Centre, Smithwick’s Experience Kilkenny, Dunbrody Famine Ship, Teeling Whiskey Distillery, Irish National Stud & Gardens, Russborough House, Glasnevin Museum, St Patrick’s Cathedral, Dublin, Boyne Valley Visitor Centre, Malahide Castle.